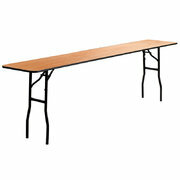 6' banquet tables will seat 6-8 guests comfortably and also make excellent serving tables. When used for seating, we recommend 60 square feet (8' x 7.5' space) for each 6' table seating 6 guests. 8' banquet tables will seat 8-10 guests comfortably and also make excellent serving tables. When used for seating, we recommend 80 square feet (8' x10' space) for each 8' table seating 8 guests. Linen Sizing: We recommend using a 60" x 120" linen for lap-length or a 90" x 156" linen for floor-length. 8' x 18" seminar/classroom tables are ideal for a classroom seating arrangement where guests will only sit on one side of the table. They can also be used as a display table or to serve food. Because of their narrow footprint we recommend they are used on hard, flat surfaces. When used for seating, we recommend 40 square feet (8' x 5' space) for each 8' table seating 4 guests. Linen Sizing: We recommend using a 60" x 120" linen for lap-length or add a table skirt to finish the look of the table. 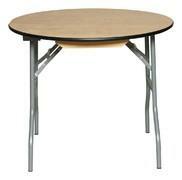 36" round tables will make excellent serving, cake, or gift tables. Linen Sizing: We recommend using a 90" linen for floor-length. 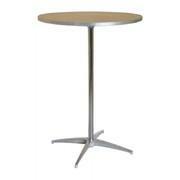 48" round tables will seat 5-6 guests comfortably and also make excellent serving, cake, or gift tables. 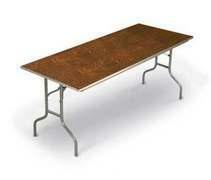 When used for seating, we recommend 56 square feet (7.5' x 7.5' square) for each 48" round table. Linen Sizing: We recommend using a 72" linen for lap-length or 108" linen for floor-length. 60" round tables will seat 7-8 guests comfortably. 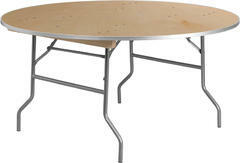 We recommend 100 square feet (10' x 10' square) for each 60" round table. Linen Sizing: We recommend using a 90" linen for lap-length or 120" linen for floor-length. 72" round tables will seat 9-10 guests comfortably. 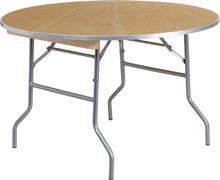 We recommend 156 square feet (12.5' x 12.5' square) for each 72" round table. Linen Sizing: We recommend using a 108" linen for lap-length or 132" linen for floor-length. 48" square tables will seat 4-8 guests comfortably. 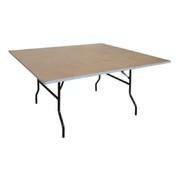 We recommend 100 square feet (10' x 10' square) for each 48" square table when used for seating. Square tables also make excellent serving, cake, gift, and display tables! Linen Sizing: We recommend using a 72" x 72" linen for lap-length or 108" x 108" linen for floor-length. Cocktail tables are a great way to alow guests to stand and visit without taking up square footage by providing seating for everybody. Ideal for patios, beer gardens, and bar areas. This charge is for table setup/breakdown. Price includes setting up and taking down tables within 50' of our delivery truck. 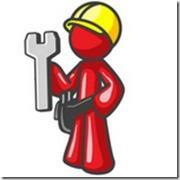 A quantiy of one represents one table set up and taken down at your event. To have twenty tables set up and taken down, add a quantiy of twenty. This charge does not include table rental! Table rental is a separate item!